Knowing how to prevent mold and mildew from growing is the best way to keep it under control. 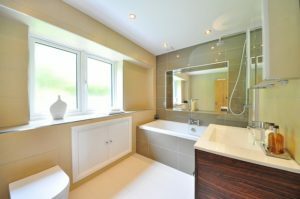 Few things instantly make your home feel dirtier and less inviting than a bathroom that reeks of mold and mildew. Not only can it be unattractive, if left unmanaged it can cause health issues and damage to your home. Knowing how to prevent mold and mildew from growing is the best way to keep it under control. Having a fan and vent system to help remove steam and moisture from your bathroom is a great way to reduce the growth of mold. However, a fan system only works if you actually use it and if it’s the right size for the space. If your fan is too small, it will still help but not as effectively as it otherwise could. Over time grout lines can become unsealed and then act as a house where bacteria can thrive. Making sure that grout is kept clean and resealed annually can prevent the problems at bay. Not only will this help keep your bathroom mold free, but it will help keep it looking cleaner too. One clever way to help prevent moisture from hanging out in your shower is always to squeegee the walls after use. Like with the grout sealant, using a squeegee keeps the moisture away while helping keep your bathroom cleaner. Two of the most significant sources of mold and mildew are also two of the easiest to deal with; your shower curtain, liner, and bathroom linens. If you have a bath mat and towels that don’t get cleaned often enough, they can begin to mold and be a massive source of the tell-tale smell. Likewise, fabric shower curtains and the plastic liners should be cleaned frequently. Investing in a mold resistant shower curtain is another excellent way to reduce mold and mildew without breaking the bank or extra cleaning. One of the most important steps to any bathroom mold reduction is to make sure there are no leaks and that if a leak occurs, it is fixed as quickly as possible. You should aim to perform routine checks of your pipes and plumbing regularly to keep an eye out for signs of wear and damage. This entry was posted on Friday, December 7th, 2018 at 8:38 am. Both comments and pings are currently closed.